Annual subscriptions include free laminated posters. State and federal law requires employers to post labor law notices in the workplace. These mandatory postings include the OSHA Posting, Federal Minimum Wage, FMLA, USERRA and various state specific notices. Failure to post mandatory labor law notices can result in hefty fines and lawsuits. Time & Pay’s service makes state and federal notices available to you in laminated All-In-One State & Federal Labor Law Posters in an easy Update Service subscription. Time & Pay’s LABOR LAW POSTER UPDATE SERVICE guarantees compliance. Labor law postings can change at any time of the year, and it is the responsibility of the employer to stay up-to-date. Here is a list of your State & Federal required Labor Law posting updates that have occurred since 2003. Let us take the worry and work out of keeping your business compliant! Our labor law poster update services automatically keep you up to date with notifications of changes to the labor law notices affecting you. When a change occurs, we will make sure that your posters remain compliant automatically. Our Worry-Free Poster Solutions offer easy ways to stay up-to-date with changes in mandatory federal and state postings. Our update service is a pay-as-you-go subscription that can be activated and/or cancelled anytime and is backed by a $25,000 We Pay The Fine Guarantee! Backed by our 100% Compliance Guarantee, our posters are developed and monitored by a team of employment lawyers and legal researchers to ensure strict compliance with posting regulations including content, size, font and color requirements. They are high quality, professionally laminated, and easy to post for display. Time & Pay’s Poster Service offers a no hassle, cost effective solution because our experts monitor all changes for you and provide the exact postings you need to stay up-to-date and compliant. If your business is located in one or more of the following states, you are required to post labor law posters in both English and Spanish: AZ, CA, FL, GA, NM, NC, NY, TX. If you do not fall into this category, it is not mandatory to display bilingual posters; however it is highly recommended if you happen to have Spanish-speaking employees. 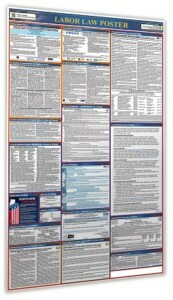 The All-In-One State & Federal Labor Law Poster is available in Spanish for all 50 states in the U.S. If you employ individuals who speak a language other than English or Spanish, it would be recommended to contact Labor agencies to obtain labor law literature in the appropriate languages so that your employees are informed on their rights. Federal and State fines are imposed by various agencies. These fines may vary. Failure to comply with posting regulations can result in fines of up to $17,000 per location (29 USC Sec. 666(i) and 29 USC Sec. 2005). Examples of the most common fines are: • Federal FMLA $100 per offense. • Federal Employee Polygraph Protection Act Secretary of labor can bring court actions and assess civil penalties for failing to post. • The Migrant and Seasonal Agricultural Worker Protection Act (MSPA) may bring court actions and asses civil penalties as well. • For failing to post the Federal OSHA Poster – A civil penalty of up to $7,000 may occur. • For failing to post the CAL/OSHA Poster – you can receive a penalty of up to $1,000 per violation. This is an exclusive program only for our customers. High quality laminated posters will be immediately shipped to you door. After that, the service is only $1/wk. There are no shipping costs.